Learn about SolarWinds' intelligent approach to cyber threat monitoring. Monitor for potential threats, and respond and report from nearly anywhere and anytime. 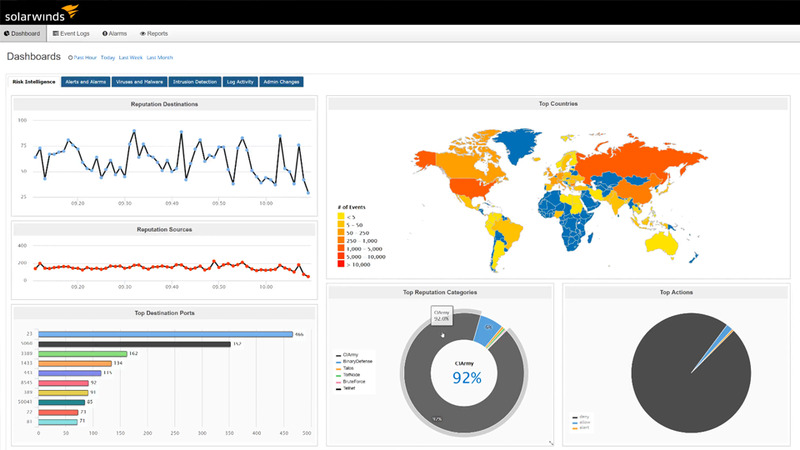 Powerful and intuitive cyber threat monitor, so you can start solving problems right away. Deploy and start monitoring quickly. Easily scale capabilities to handle organizational growth. We’ve worked as network and systems engineers, so we understand your problems and how you want them solved. Monitor, respond, and report security threats on your managed networks. Make informed decisions by having the latest threat intelligence at your disposal. Receive updated cyberthreat intelligence from multiple sources, including IP and domain reputation databases, to monitor for known and unknown security threats. Take a centralized and powerful view into event-time log notifications from everything on your network. Collect log file information from disparate sources, and hone in on the most critical threats by rapidly assessing intent and severity. Threat Monitor™ is designed to hunt the threats for you, enabling you to focus on real threats, not sifting through logs. Normalize logs from your ecosystem, and analyze them against multiple sources of threat intelligence. The task of long-term log management now made easier. One year of normalized and raw log archive is included, which can give you the ability to recall and compare past incidents with recent events. Qualify and quantify internal and network security threats across your on-premises and hosted data centers, and public cloud environments like Azure or AWS. Automatically analyze the amount and types of cyber-security attacks, and use this near real-time data to create and implement actionable incident responses. High-speed log search for post-incident forensic analysis. Rapidly normalize, search, and analyze thousands of logs to understand the nature of ecosystem vulnerability, threats, and attacks. Automatically respond to and remediate detected threats. Automate intelligent responses to quickly remediate security incidents, which can remove the need for constant user threat assessment and interaction. Receive automatic notifications when a user-configured threshold is exceeded. Multi-conditional, cross-correlated alarms work in tandem with the Active Response engine to help you identify and summarize important events. Compliance worries can now be a thing of the past with a comprehensive set of integrated reporting tools. Demonstrate audit compliance by leveraging existing report templates, or create custom reports to fit your business needs. Help grow your managed service offering with threat monitoring, incident response, and reporting capabilities. With multi-tenant architecture and white-labeling capabilities, you can safeguard your managed networks with a cyber threat monitoring tool designed with the needs of MSSPs in mind. Descripción general de las características Learn about SolarWinds' intelligent approach to cyber threat monitoring. Does Threat Monitor impact the performance of my network? What types of threats does Threat Monitor detect? What data types can be collected and normalized for reporting? How is Threat Monitor - IT Ops licensed? Is there a Threat Monitor version for Managed Service Providers? Threat monitoring with a negligible performance footprint. Threat Monitor is cloud based, so it consumes a negligible amount of resources with little impact on the performance of your network. The elasticity built into Threat Monitor allows for a broad monitoring strategy. Threat Monitor has visibility of network traffic, helping to detect issues ranging from compliance to malicious attacks without signatures. If it generates a log, we can support it. Threat Monitor can consume logs from sources such as Syslog, Ossec, JSON, WMI, Snare, DB Queries, RegEx plugins, and many others. Affordable pricing that allows you to pay as you grow. Threat Monitor is licensed on a simple “by node” model where you only pay for what you need, unlike more complex volume-based models. Threat monitoring, response, and reporting tools for managed networks with Threat Monitor - Service Provider Edition, designed with Service Provider workflows in mind. Dedicated monitoring performed across networks and/or endpoints for signs of known and unknown security cyber threats.